Range cairt o the giraffe dividit bi subspecies. 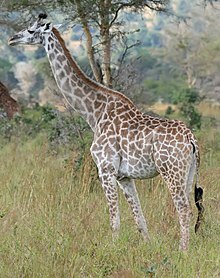 The giraffe (Giraffa camelopardalis) is an African even-taed ungulate mammal, the tawest livin terrestrial animal an the lairgest ruminant. ↑ Grubb, P. (2005). "Giraffa camelopardalis". In Wilson, D. E.; Reeder, D. M. Mammal Species of the World (3rd ed.). Johns Hopkins University Press. p. 672. ISBN 978-0-8018-8221-0. OCLC 62265494. This page wis last eeditit on 23 Januar 2019, at 21:16.